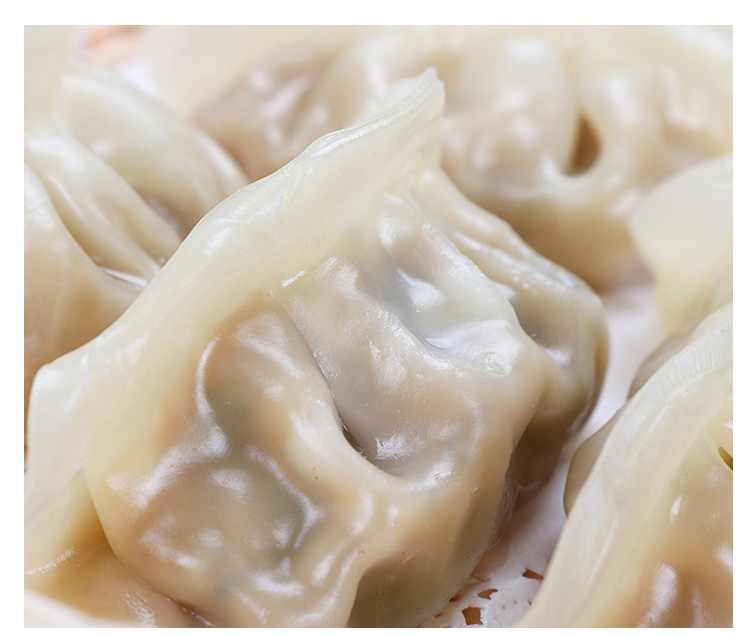 Dumplings have a history of more than 1,800 years. It is a traditional specialty food that is popular among the Chinese. It is a staple food and local snack and is also a staple at Chinese food festivals. There is a custom in northern China: During the holidays, we welcome friends and family, and we always eat dumplings. 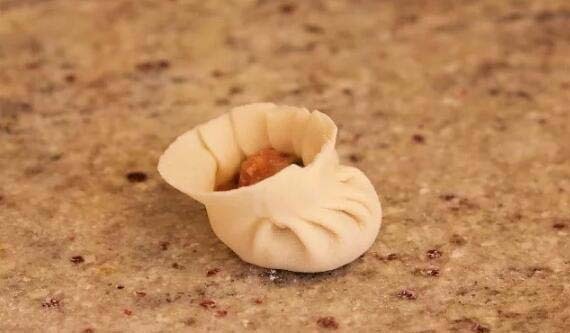 We call them jiaozi in China. Especially on New Year’s Day, the whole family celebrated the year, so they sat together and chatted while making dumplings. They talked about everything, and they laughed and laughed. 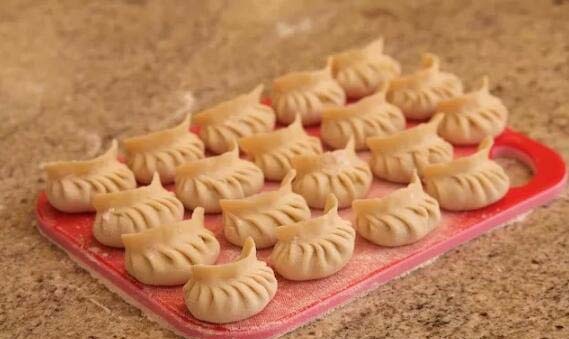 The dumpling recipe introduced today is very detailed, so even if you have not made dumplings, after reading this tutorial, you can make delicious dumplings too! 4) Chinese cabbage leaves: 4 pieces. To choose the bright yellow part of the cabbage, the green leaves wrapped on the outside taste very bad. Step 1. 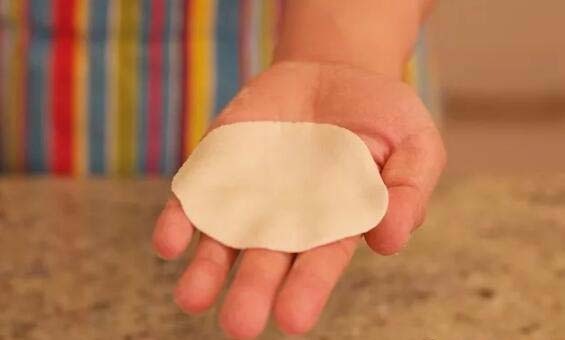 First, we must start with dumpling skin. 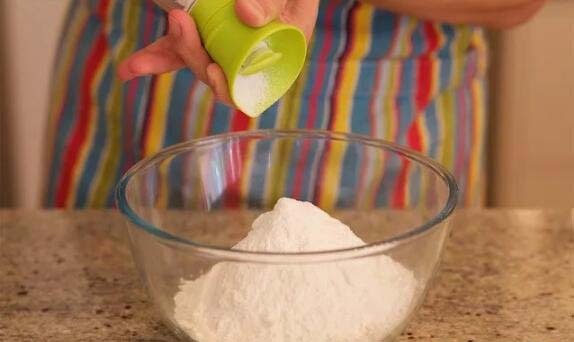 Weigh 350 grams of flour, add 2 grams of salt, and stir the two evenly. 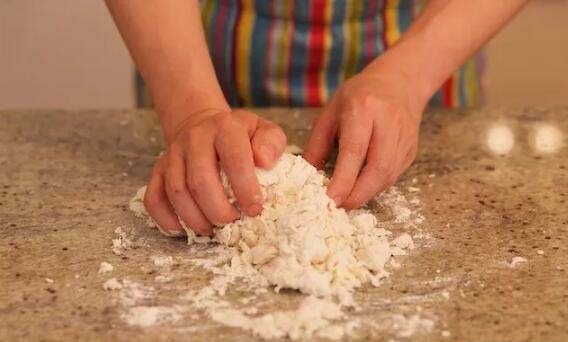 Salt increases the strength of the gluten and makes the dumpling skin smooth and elastic. Step 2. Then pour 200 grams of cold water and stir quickly while pouring. Step 3. 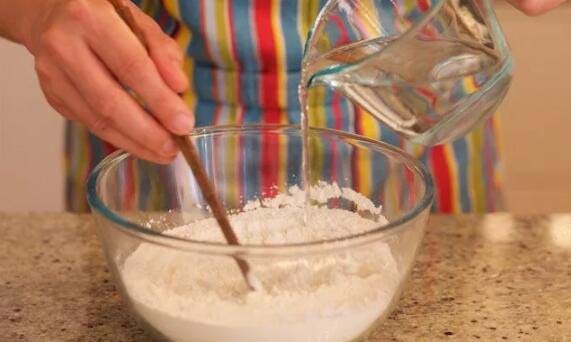 Transfer the mixture from the bowl to the work surface (if the kitchen counter is not suitable for the dough, transfer it to a large pastry board) and mix the dough by hand. Step 4. 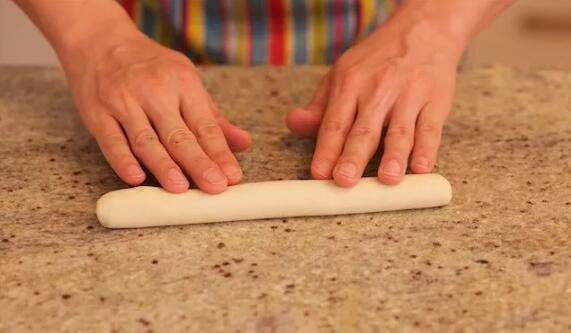 The dough should be evenly smooth and elastic, which is the same as the picture below. The whole process takes about 15 minutes. Step 5. The dough at this stage is not ready for use because the gluten in the dough has accumulated too much stress and the elasticity is too great. It needs to relax and rest. The relaxed dough becomes very soft and can easily be twisted into the desired shape. When letting the dough rest, keep it in something air-tight, like a container or wrapped in plastic wrap, so that it does not dry out. Step 6. While waiting for the dough to relax, we can prepare the filling. Today, the dumplings we are going to prepare are Chinese Cabbage and Pork. This is the combination of the common dumpling stuffing in the north and my favorite taste. Take 4 cabbage leaves, wash and cut into large pieces of 5 cm width. Step 7. 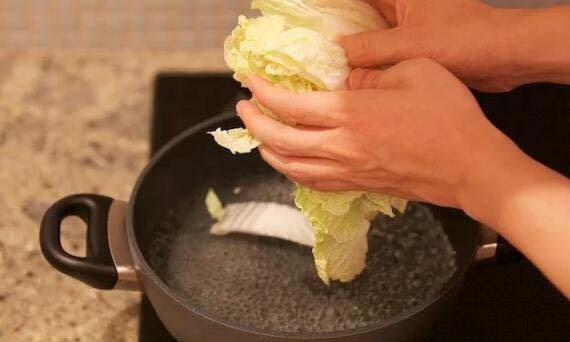 Put the chopped cabbage into a boiling pot of water and cook for 5 minutes. Step 8. Take it out and rinse it with cold water. After cooling, dry the leaves. Step 10. 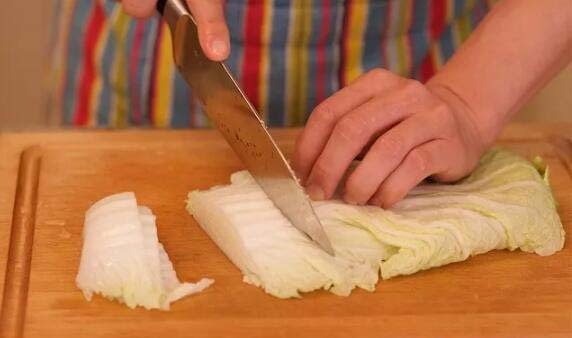 Cut the dried cabbage leaves into small pieces. Step 11. 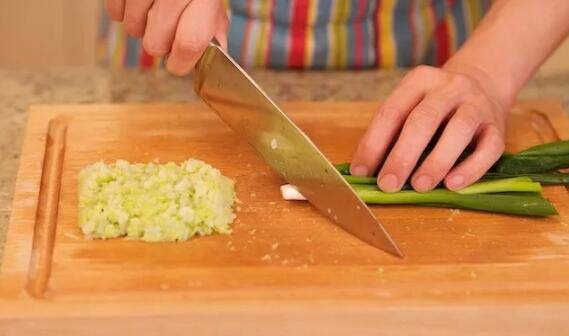 Chop 25 grams of green onions. Step 12. 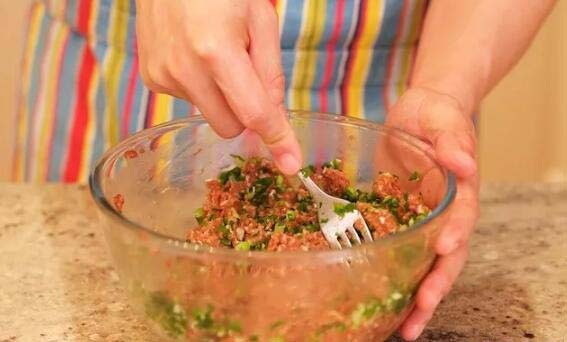 Put 500 grams of ground pork into a large bowl, add 1 teaspoon of white pepper, 4 grams of sesame oil and 40 grams of soy sauce. The soy sauce is darker in color and can be used to dye the dumplings into an attractive brown color. Step 13. 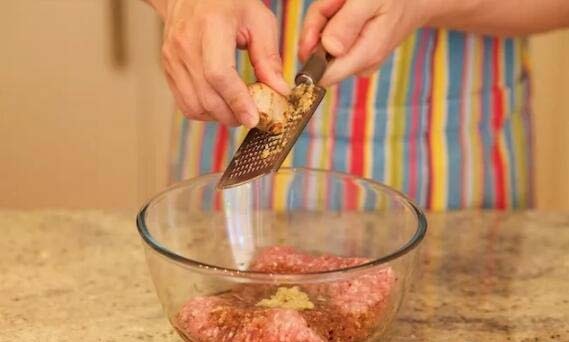 Add 4 grams of cut or ground ginger. Step 14. 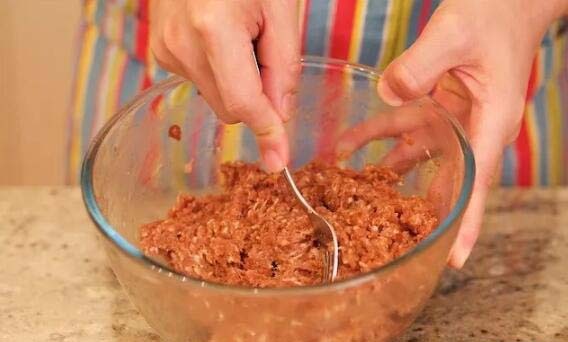 Then use a fork or chopsticks to stir in. The purpose of this is to ensure that all ingredients are incorporated together, and therefore will stick together in the cooked dumplings. 15. 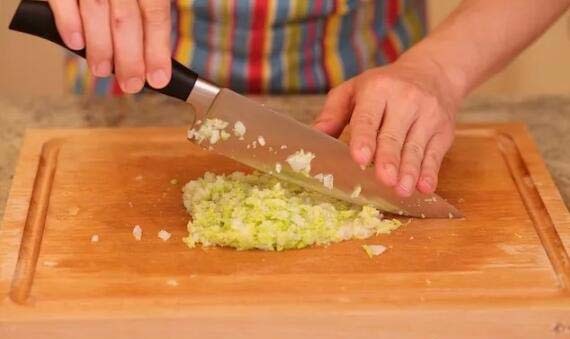 Stir in chopped green onions. Step 16. 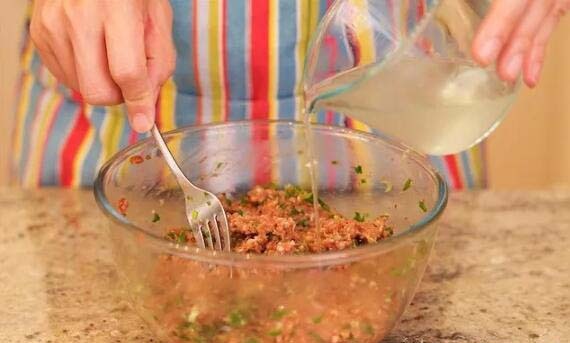 Add the cabbage juice squeezed out earlier into the meat, stir, let the meat fully absorb the juice. Step 17. Then add the chopped cabbage and mix well. Step 18. 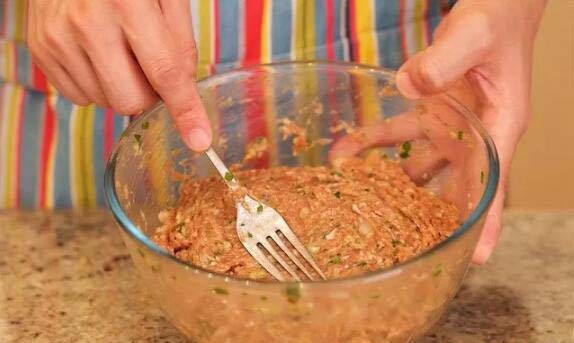 Now, our dumpling mixture is ready. 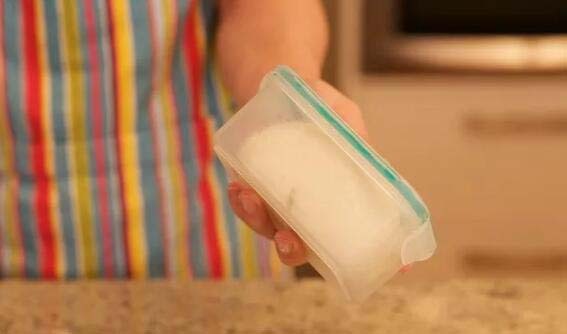 Put plastic wrap over the top of the bowl and put it in the refrigerator for about 10 minutes. 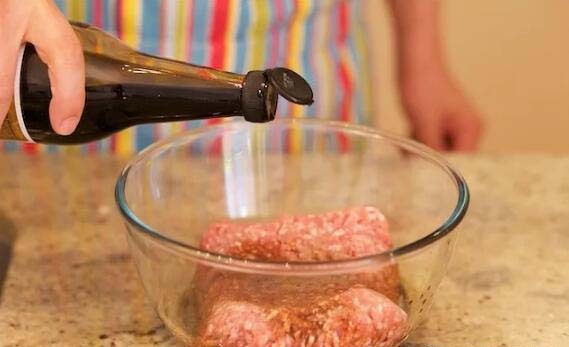 The water absorption capacity of the meat filling will decrease as the temperature rises. In order to avoid the evaporation of the water in the filling during the packaging process, it is necessary to refrigerate it. Step 19. While waiting for the filling to refrigerate, we can handle the dough. 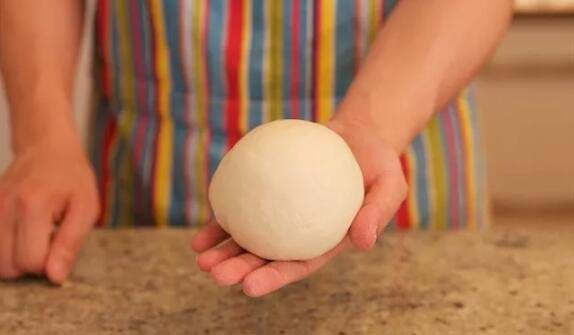 Divide the dough into four equal parts and roll one of them into a long strip of about two centimeters in diameter. The remaining dough is placed back in the sealed box to prevent it from drying out. Step 20. Cut the strip into 12 equal parts. When cutting, twist the strip by 90 degrees for each cut, otherwise you will not have uniform pieces. Step 21. Round each piece. Step 22. 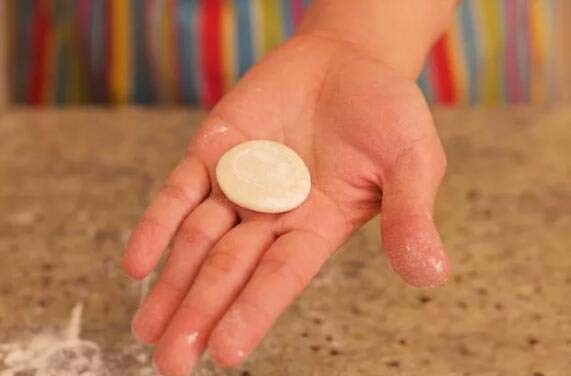 Coat with a bit of flour, and press flat on the counter into a shape like is shown below. Step 23. 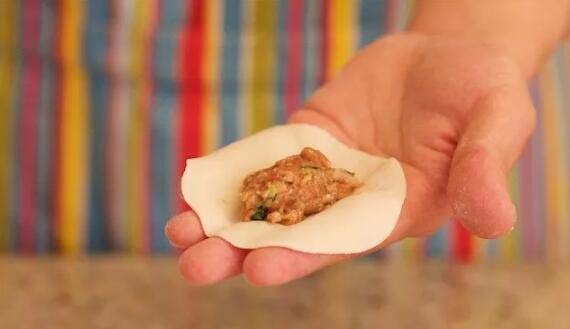 When making dumpling skins, it is best to put them into a sealed box after finishing each roll, so that they do not dry out. Step 24. 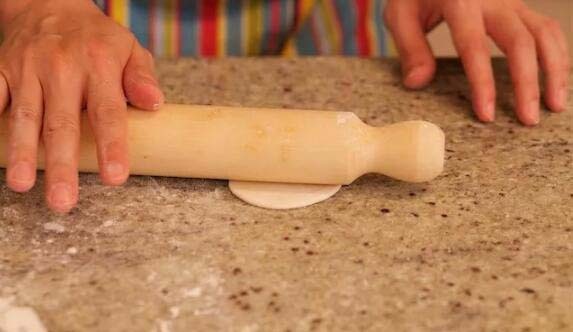 To form the skin that will be ready to fill- coat with some flour on both sides of the dumpling skin, then use a rolling pin to make it thin. 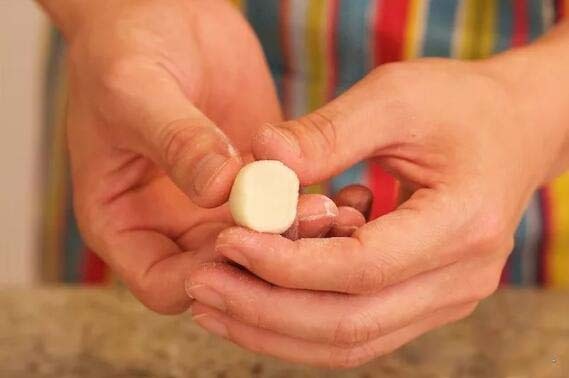 It is best to turn the skin as you roll it out, this makes it thinner at the edges. It is important that the skin is thicker in the middle than at the edges. Step 26. 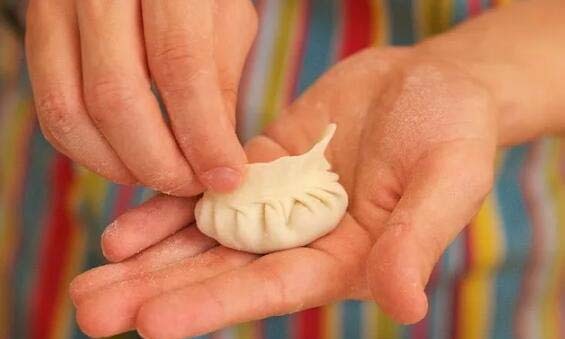 Take out the refrigerated dumpling stuffing, take a small amount in a small spoon, place it in the center of the dumpling skin, and roughly round it with a spoon. Step 29. Then push the part without the pleats to the part where the pleats are pinched and knead them together. Step 30. The result of a busy half-day labor will be well worth the effort when you see how beautiful they are. At the beginning of the packaging, the movement will be slower. 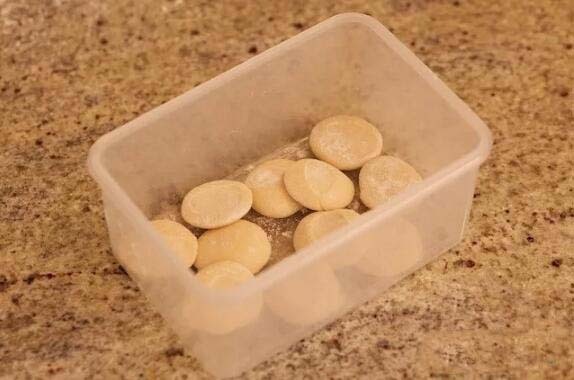 In order to avoid the dried surface of the dumplings, they can be stored in a sealed box. Step 31. Fill a pot 2/3 full of the water and bring to a boil. Note that the amount of water must be sufficient. 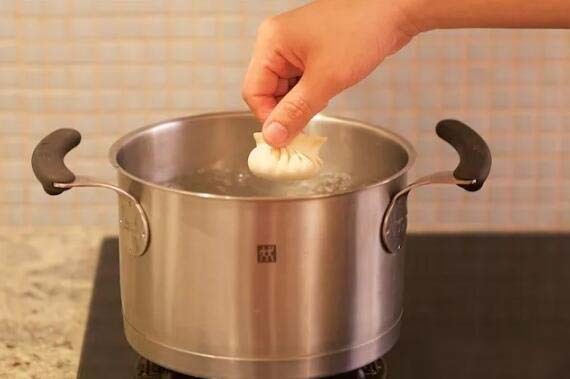 Only when the amount of water is sufficient, the water temperature will not drop too much when the dumplings are put in, ensuring that the surface of the dumplings has been cooked before it comes into contact with the bottom of the pot, so that it will not stick to the bottom of the pot and will not stick to each other. Don’t put too much in each pot. Like the 20 cm diameter pot in the photo below, we cook about 18 each time. Step 32. 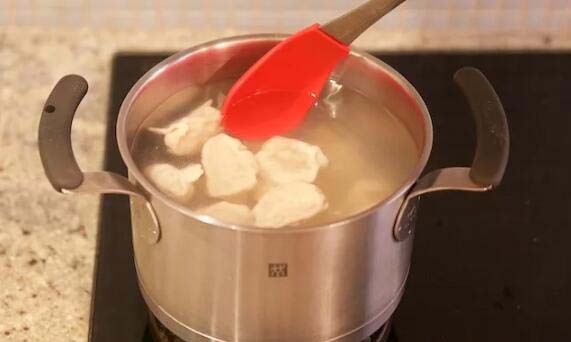 After all the dumplings are placed in the pot, use a silicone (or wooden) spoon to stir the water in the pot, and let the water drive the dumplings to turn them together to prevent them from sticking together. Don’t push the dumplings directly with a spoon, lest you poke them (this is why you should use a silicone or wooden spoon instead of a sharp metal spoon). 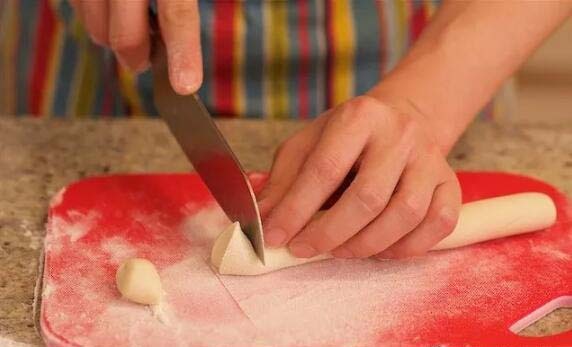 After a minute, wait until the surface of the dumplings is shaped. Step 33. When the water in the pot boils again, pour a bowl of cold water on the dumplings and start timing. 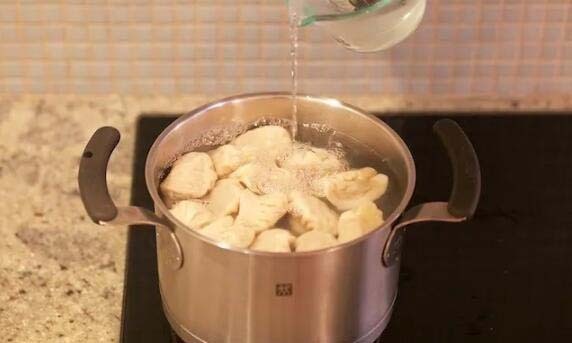 It takes about 5-6 minutes to cook the dumplings, and cold water needs to be poured 2-3 times in the middle. 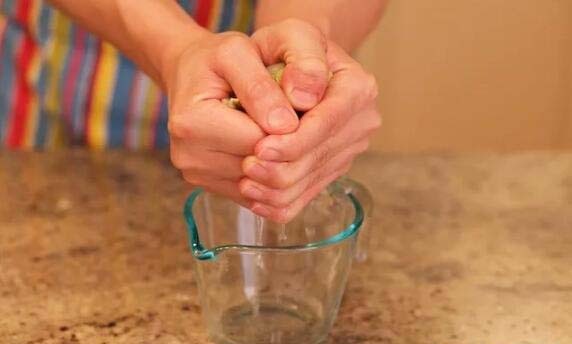 The purpose of pouring cold water is to shrink the surface of the dumpling skin and maintain the taste. Step 34. Cooked dumplings are best served hot. 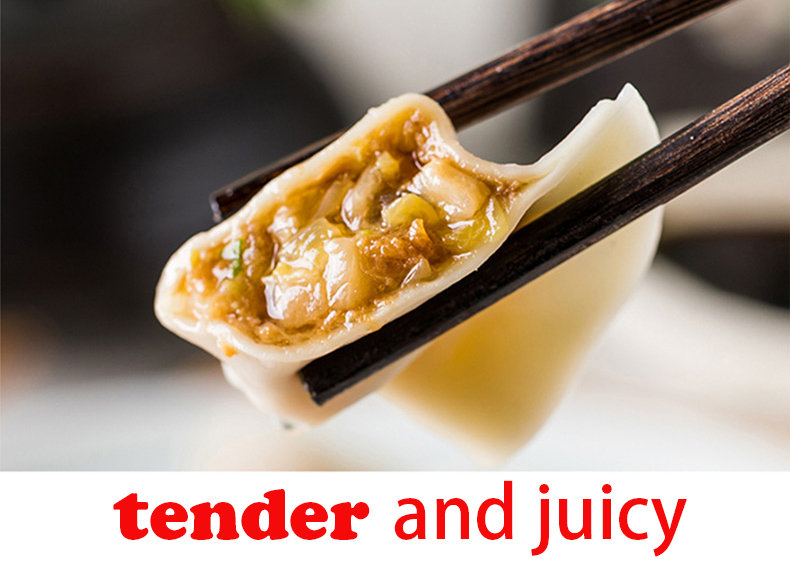 Eat a hot dumpling, served with a favorite Chinese sauce. This will be a first-class dining experience. The dumplings wrapped in the method described here not only have the elasticity of the outer skin, but also the juicy stuffing is absolutely not comparable to the cold frozen dumplings in the supermarket. Of course, the most important thing is that your family can finally make dumplings. The next generation has a lot of warm memories to relish. 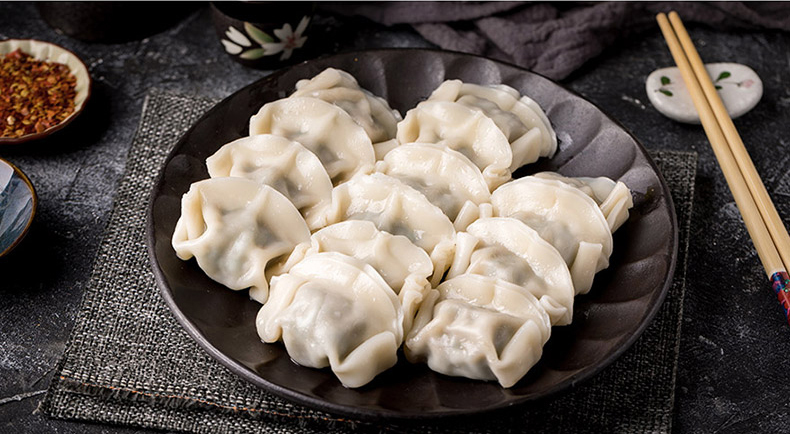 The dumpling skin is not the same as the noodles, the dough can’t be too hard, otherwise there will be no pleasant, soft texture after cooking. When the dough is too hard, it is time-consuming and labor-intensive.